I've had quite the hard week both physically and mentally, but I still managed to prep this post and the next one, and I hope you'll get a little inspiration out of them. Of course I was hoping to get this one up earlier but being sick and all didn't really allow me to properly put on makeup and all that jazz. 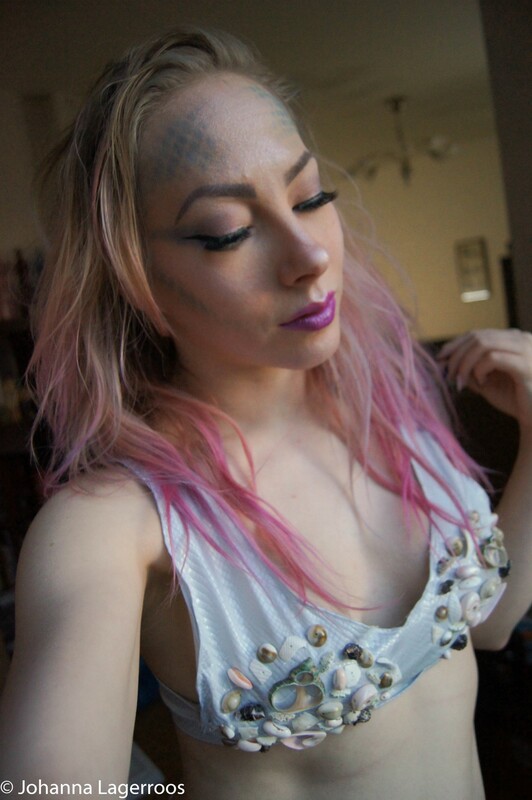 However, today I'd like to show you an interpretation of mermaid costume and makeup. I know this is not the most original thing ever, but I wanted to try my hand on it for practice - and also for reflecting how I could do this better if I ever were to dress up as a mermaid for any event. So this is not by any means perfect but it was fun to try out anyways. For the makeup, I tried to go for colorful and highlighted, but it doesn't translate too well on the pics because it started to get quite dark once I was good to take the photos. Not too happy about that but hopefully you can live with it. I feel like I'm so rusty with photography and everything, so I'll need a little practice to get back on the swing of things. 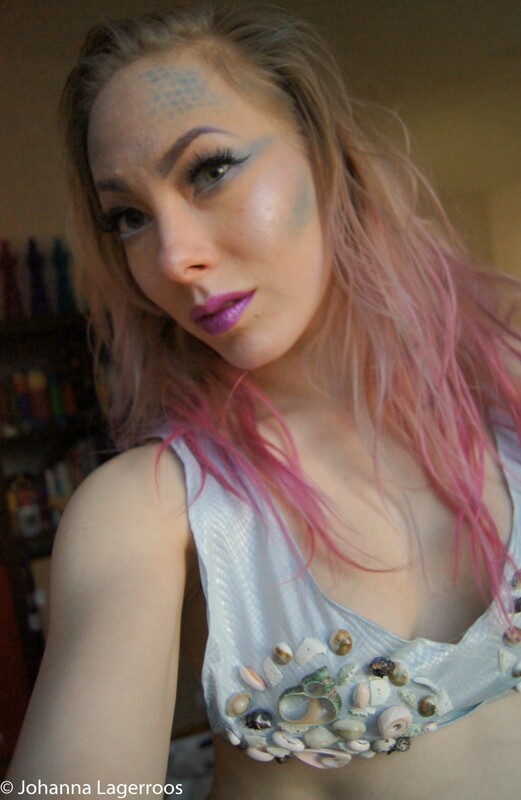 For the makeup I used pinks, purple and blue from the Makeup Revolution Unicorns Are Real palette. I feel it has perfect shades for a look like this, and you can go very subtle or build them up very opaque if you want to. I actually have a post coming in the next month with swatches of that palette and many other things I got from Makeup Revolution, but you'll see quite a bit of the items used in my Halloween looks. The scales on my face are used by the basic technique of using fishnet stockings as a guide. I literally pulled a pair over my head and padded on the blue eyeshadow until I was happy with the shade. If I were to do this to a party, I would try to make the scales multicolor so that they would kinda look holographic if you get what I mean. For the shine, I packed on a ton of Makeup Revolution highlighter in a pink shade. It's a nice affordable option in my opinion. I also tried to make my brows purple with eyeshadow and added a semi metallic lippie to add to the shiny look. You could also add all sorts of glitter and gems to make this even better, and I think I may have to try that at some point. The lashes I wear here are D207 from Dodolashes, but really any thick pair would do for this kind of "fantasy" look. 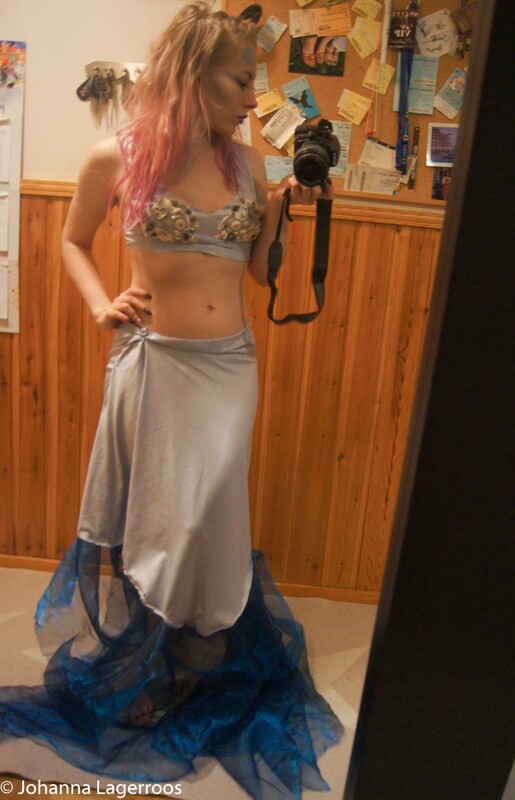 For the outfit, I tried to create a mermaid costume myself. Now, I gotta say it's not as nice as I would've liked to, but that's literally because I didn't get a pattern for it. 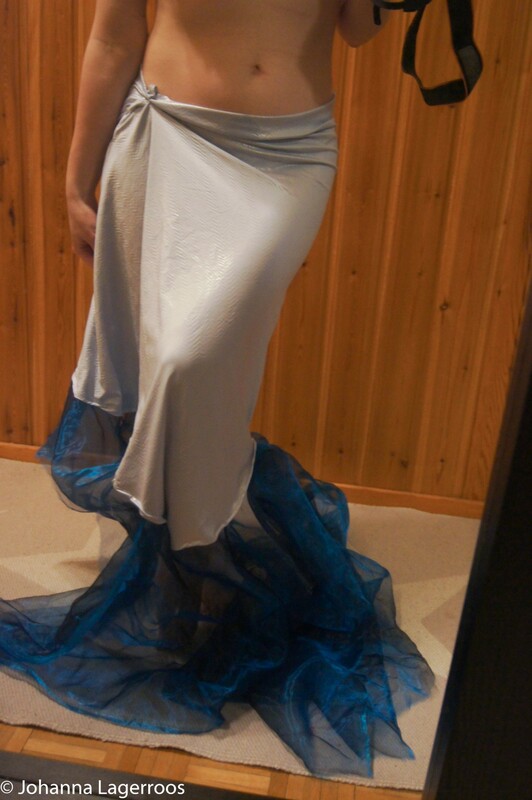 But anyway, I wanted to make a skirt with fitting top part and wide hem so that it would kind of look like a tail of a mermaid. I had this old shiny blue fabric for the fin part and got a affordable snake print fabric for the rest of the skirt and the top. 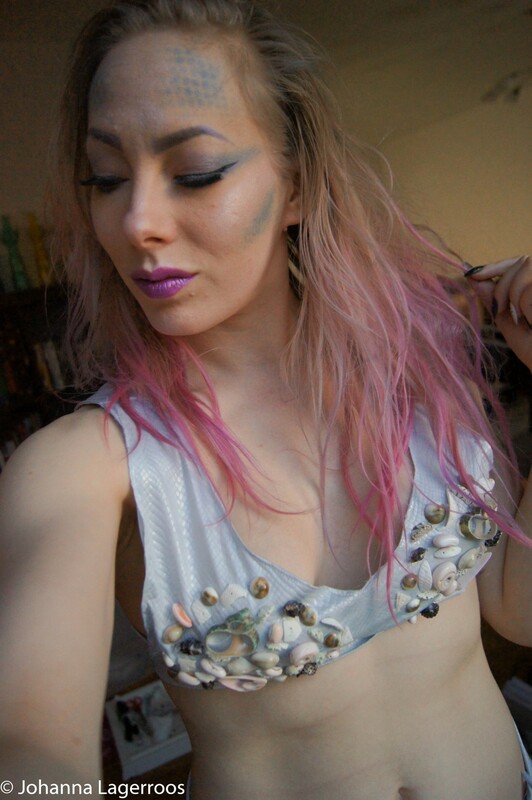 For the top I created a very simple crop top and hot-glued seashells I had on my drawer. It would look better with more seashells but that was all I had. Of course one could also make two giant seashell shapes out of the fabric with something inside to make it a little thicker, but I didn't have the gear for that right now. Lastly, a photo of the skirt itself. It fits a bit funny because I feel I didn't use the right stitching, but it still looks quite nice. I would love to make this more properly with more time in the future, so stay tuned next year if I end up doing a 2.0 version of the whole look here. 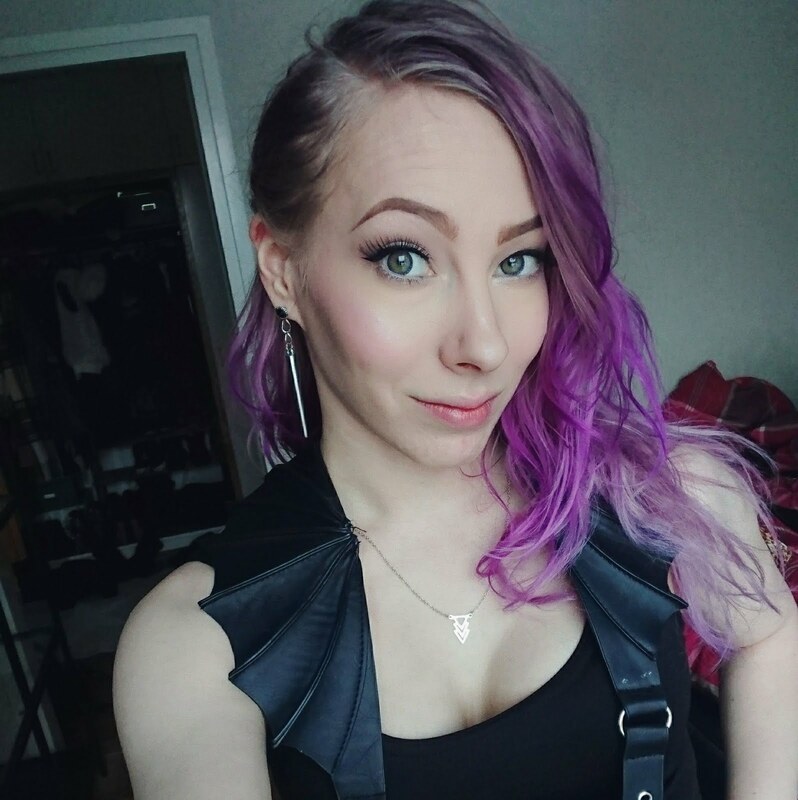 Next costume will be a little more put together because the costume is easier to put together, so I hope you'll like that one even more than this one. In the next post, I will show you another set of Halloween nails - and I will actually write and schedule it after posting this one so that it'll go up no matter what. I'll see you on the next post very soon! I always loved the Halloween make-ups and outfit of yours because they are all inspiring and gorgeous...so I am anxious to see them all!